There’s a lot to love about Jurgen Klopp – his slightly quirky persona, his passion on the touchline, his genuine warmth towards his players. The Liverpool manager showed that he has that in spades again tonight with a classy tribute to Loris Karius as the club confirmed the signing of a new goalkeeper in Alisson. Although Klopp told Sky Sports his team were in need of a world class ‘keeper, he made it clear he views the Reds as having three quality players in that position. 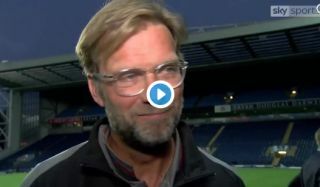 "The club needs world class goalkeepers"
He also took the time to praise Karius’ display in the team’s friendly win over Blackburn, saying he saved them a few times, and hit out at jeering fans mocking him whenever he had the ball. Alisson will surely replace Karius as number one at Anfield now, but it says a lot about Klopp that he thought about Karius after his Champions League final nightmare and took the time to praise him as his replacement comes in.